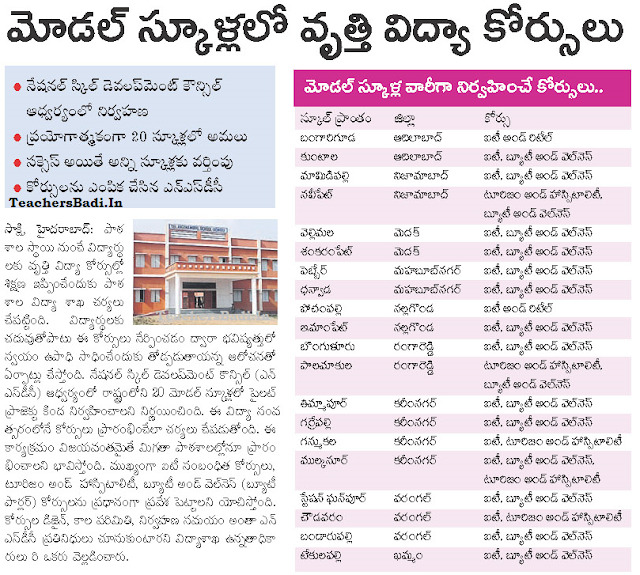 Rc.70 Vocational Education Courses Started in TSMS, List of RMSA Telangana Model Schools: RMSA Telangana, Implementation of Vocational Education: School Education and Ex-Officio Project Director, RMSA, Telangana,Hyderabad has given Proceedings Rc.no.70 on 19-06-2015 to all the Principals of Model schools in the State for implementation of Vacational Education in identified Telangana Model Schools. This proceedings details as follows. 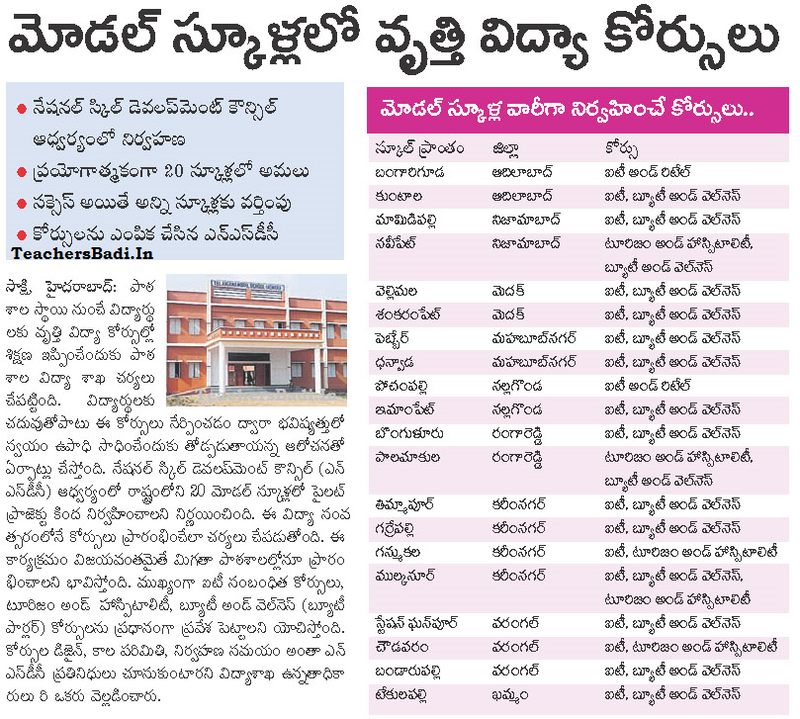 The under mentioned Principals of Model schools are here by informed that, the Director of School Education, Telangana, Hyderabad has decided to implement Vocational Education in identified 20 Model Schools in the State. courses is being implemented on par with other States. The above said courses have been allocated to the 20 Model Schools based on the location of the school situated and other facilities (List enclosed) further. The course period will be of two years for each trade starting in IX class and continued to class X. The curriculum and syllabus will be matched to the syllabus of +2 level and higher level. The Vocational Courses will start in the academic year 2015-16 and begin with class IX in the identified 20 Model Schools. 4) One period from Computer Education may be allotted to Vocational Education ( 1 out of 2). Syllabus prescribed by the PSSCIVE will adopted and modified as per need and request of local environment. The content copies shall be printed and suppied to schools. Syllabus and nature of practicum, required equipment will decided in the work shop with expert agencies / individuals. Therefore all the Principals of Model Schools concerned are requested to follow the above instructions. Further the District Educational Officers of the district concerned shall take necessary steps in the matter, detailed guidelines issued latter. This has got approval of Director of School Education, Telangana, Hyderabad.